JERUSALEM (Reuters) - President Shimon Peres urged Israelis on Friday to show respect for the United States, seeking to soothe relations with the country's most powerful ally that have been strained over Iran. Prime Minister Benjamin Netanyahu has condemned a proposal, endorsed by Washington, to reduce sanctions if Iran suspends parts of its nuclear program. 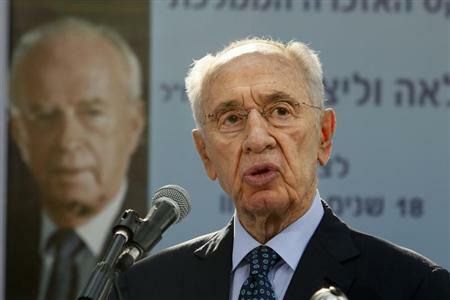 Several ministers have also harshly criticized Washington, prompting Peres to intervene. "We must not underestimate the importance of this friendship. There can be disagreements, but they must be conducted with a view to the true depth of the situation," Peres said in comments released by his office. "If we have disagreements we should voice them, but we should remember that the Americans also know a thing or two. We are not the only ones," he said. Although Peres's position as president is largely ceremonial, he is a widely-respected elder statesmen and his comments will be welcomed by Washington. Netanyahu and U.S. President Barack Obama have often tussled over Tehran, but tensions flared last week when Israel discovered the terms of a deal that world powers are due to discuss again with Iran in Geneva next Thursday. Israel says tough sanctions must remain until Iran dismantles its entire uranium enrichment program, arguing that anything less would enable it to develop nuclear bombs. Iran denies it is seeking nuclear weapons and accuses Israel, believed to be the Middle East's only nuclear armed state, of hypocrisy. Backers of the nuclear talks see the diplomatic push as a way to resolve a decade-long nuclear standoff that both Israel and Washington have said could lead to war. U.S. Secretary of State Kerry said Netanyahu was over-reacting to the proposed deal and a State Department spokeswoman dismissed an Israeli estimate of its impact on sanctions as "inaccurate, exaggerated and not based in reality". Netanyahu has said he would not be bound by the terms of the Iran deal and reiterated that Israel would take military action if it thought Iran was close to getting an atomic bomb. Relations with Washington have also been strained over the lack of progress in peace talks with Palestinians, with Kerry calling Israeli settlement building "illegitimate". A minister in Netanyahu's inner security cabinet, Naftali Bennett, flew to Washington this week to urge members of Congress, many of whom are very close to Israel, to reject the proposed Iran deal. "I think more and more members of the House and Senate understand now ... that the deal being formed is a deal that removes the sanctions without dismantling the Iranian nuclear machine," Bennett told Israel Radio on Friday. Some Israeli analysts have warned Netanyahu not to try to play Congress off against the U.S. president, and Peres made a point of praising Obama's efforts on behalf of Israel. "There has not been an Israeli request which the Obama administration has not responded to," he said.